The parrot was taken refrain a branch of the gulmohar one evening and kept on cleansing its body with its beak sometime. As usual I was getting breezy outside the terrace and watching birds chirping around, I saw this parrot sitting on a branch, lonely, while others flying above the sky as habitually. I brought the camera actually to capture the mynas, that where taking refrain side by side on a branch, but before I click back, they flew away and the parrot came alone. 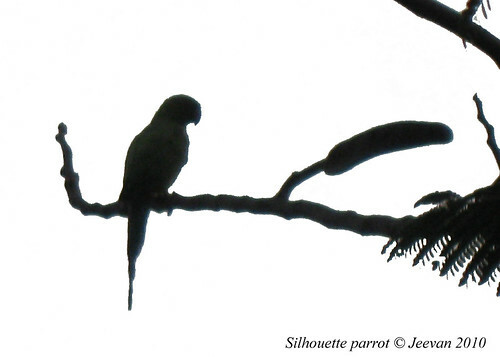 As it was sunset taking west and I was facing it thus, captured the parrot that fell into black along the branches. Just to make an impression, I add white color to the grey background. p.s Thought it was pleasant at present, there was something (I don’t want to say) annoyance going along, that stops me from blogging quite sometimes. I can’t avoid even when it showcase its true face that anguish and general visage that often express love and desire. I wonder were gone these thus when I was struck with phase that cause great distress and fear. I just want to say in front of these faces, but I no more bear strength to rip and I will never get peace by hurting these and expressing my emotions, but I learn every time what relationships mean through these that happens occasionally on vacations. holding a scar on its surface. to fold in as a pipe to blow. 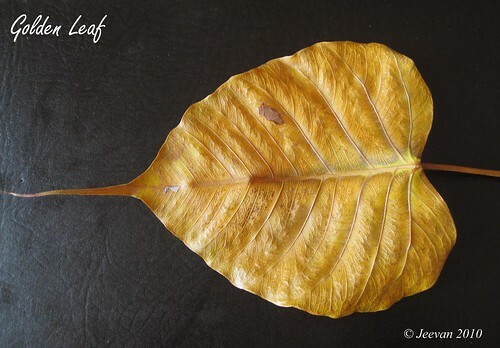 the leaf expose to golden hue. A smile makes a person smarter and happiness turns a person healthier. Forget is something we all go through and we’re in need sometime to let something indicate us to memories. Whether it’s a person or thing, when we lose touch with something, we lack memories unmindful. Sometimes life is freely imprisoned like someone in a prison. ‘Thus I feel sometime that mind wanders freely, but imprisoned by excess. Nature has created us many things to take shelter, but we always wish for others. Many times people live for others, not knowing or doing what they truly need or desire but trying to capture others attention by being trendy like others. We can go with people, and there’s no mean to do whatever they do. Never like before, I felt so distress because of an incident that happened on Monday. My heart struggles to beat for minutes listen to the desolate end of a cousin who hanged herself. Since childhood I like her a lot and wish to spent time with her and she’s very kind, lovable and softhearted person and never turned her inherent even then we aren’t familiar like before. Nothing bothers me like her departure lately and even then I missed my grandma couple of years ago, who lived along with us, I couldn’t sense such intense alike her. I know my grandma’s departure was peaceful and intend to age and potential, but her expire is a tragedy and will hurt forever thinking about her. She know nor not I like her a lot and even then she wasn’t interested to talk or share with me I often think about her and care for her good sustain. It was about 24 hours she left my home, where I met het at last and when she says the least words ‘bye jeevan’, I never thought it could be the last. My emotion might be decreased at least if I haven’t met her this closer hours and she was very casual as usual and watched my pictures slideshow on computer and being get-together as families thus were we gathered for a event at home on Sunday, it was fun and laughter Sunday where she shows no sign to attend suicide. When I think those last hours I couldn’t believe her true expire and I truly tear for her now silently. I used to wonder sometimes how she forget those days and happiness shared together and either visiting our homes on vacations and when I think now it sense dumb. Who can’t understand or recollect the memories of her parents and dear ones love, desire, sacrifice and the worthless sum they brought for her and celebrating her childhood days, how can she commit suicide whatever reason perhaps she has to take this decision. Still the reason remains mystery and I don’t want to think or say something, and keeping away the thing whatever it might be, I just wonder in anxious how she could take this decision and what force her more than her parents, who are very friendly I have ever seen. I sometimes wish to be alike them, and her parents – my uncle and aunt, are so energetic and cheerful the moment whenever we get together. They gave her much freedom to chose her carrier and she worked in varies cities under an IT company and lately her parents were looking for a bride-groom and while she took this decision. I don’t know how my uncle and aunt are going to bear this and convey throughout their life. Especially I’m worrying a lot about our aunt, who I have never seen her much in tears and distress and she’s a easy go person and much cheerful. I’m always against suicide and think who we to perish our life and did we brought it to defeat. I can’t even imagine how painful she might gone through her departure and thinking about it feels scary and freaking. Life flew away in minute we take wrong decision and then we are no were to feel and who suffers a lot is our parents and dear ones. I always keep this in mind and have come across such parents and I could understand there pain and generally I think always that my decisions should never disturb my parents. They are always and already suffering for me and even if they could, I can’t bear them seeing in distress and physically stressed. In my view, what the only guilt she did the worst is committed suicide and what are we feel guilt ones is just nothing these days and we have grown in knowledge and realization that doing mistake is nature and related to sense and in need. Who haven’t commit mistake in this world and when it comes to realization and truth, it immerses into the ocean and flies away into the sky. Whatever the problem in this world, we have a solution in some ways or just accepting the truth or fate and try to face the life it has for us. I too have so many wishes and problems alike others and I sense I have more than enough, but with my conscious, I seek to live in between these, accepting what is for me. I wonder how well I have observed the life and obvious about me, and do things with less knowledge and experience, and thus how come others with rich knowledge, education and transparent in mind and health act senseless and fail to get inspire from others. When people like us with immobile willing to live, what cause these idiots to die in short temptation or whatever to say. I always wonder and in selfish, why these people can’t take inspire and get solace by having a best life than us. Sometimes I like to say those commit suicide are very selfish, thinking about themselves alone and keeping away those crave for them. Though we can’t totally blame her and even we come to know what cause her to do so and what disturbs her intend and fear, but still I argue that self immortal is stupid and I’m not sure how well I sustain this mind forever. Let’s leave it to future decision. Life isn’t dedicated to a particular purpose alone and it has many things to do certain. Think I see life from a certain distance and never gone beyond my parents and thus perhaps I don’t know whether there’s something intend beyond that and think I’m at basement of life and many raised as a building to see life at distance. I have been growing around my parents intensely and know how important I’m to them and how well they’re to me. But every life is not same and the way they enjoy the freedom in mass differentiates there life and world they see. Love is something that cause affection and parents are those give us without an intention and whereas no other relationship gives that intensive. I have seen few mothers in the past lost there children due to accident and what the life they live is simply deceive, but I will never put path for a debate, as I have no more to say and nothing could describe a mothers love and care towards her children. Think I’m going somewhere leave the matter and why I’m saying these because, who is going to suffer a lot after a child’s depart is the mother - apart wife, husband and children, and I don’t know what cause will console my aunt. Whatever I say is nothing going to change anything and goes pause in silence. My cousin has chosen her solace from whatever disturbed her through departure and we’re seeking to get solace from whatever left behind her in memories. I feel deep regard from my heart to my aunt and uncle, and I wish to be there always to cause solace to keep them away from distress. Thank you! Angadi Theru – a walk into the street! There’s nothing majestic to say about this movie, but it’s all about love at new site (plot) and reflection of existing life. Angadi Theru – the shopping street, bring back those memories of walking back into Ranganathan street in T.Nagar. The street being famous with chennaities exists like shopping means Ranganathan Street! The movie discloses the concealed life behind those immense stores. It’s obvious the movie indicates the Saravana store and many other stores that bring youngsters from their native homes to employ in support there state and lives, but there are some unknown facts such as endurance are exposed here behind the joy of purchasing. It seems like the director has taken the story from the common occurrence. The all new faces and being non famous keeps away the thought of watching a movie and characters performance is very practical and though enjoyable through comedy section – Black Pandi of kanakanum kalangal does a fabulous job, and emotion over the imposed inhuman on workers and treating them like prisoners. Whether it’s true or illusion it’s hardly believable that slavery still exists. It’s a trend that directors turning villain these days and A. Venkathesh has the stubborn face and does worth bad supervisor being called as ebony. The lead pair is adequate to the story and looks fresh like a bloomed flower, and since it’s their debut they’re well introduced already in a different aspect. The songs are sure to ring for long esp. Aval Appadi Onrum… is very pleasant and simple in lyrics. The Kadhaigalai Pesum… is simply rejoicing to sense adding Benny Dayal and Hamsika in sweet vocal. These are my favorite songs and often murmuring it now. Every song stands for something renews and I understand the worth of music thus created by two music directors together. The director has observed little things well. The railway crossing incident and the vehicles run over those roadside sleepers are among those so realistic and recall the late incidents. The rubber ball cricket in village, the true taste of strawberry, the self employment of a toilet cleaner and destruction of true love are so real. I always expect the director to do more films as he touches realistic and captures the true happiness and sorrow we lost in logic. The late Album and Veyil of Vasanthabalan are my favorites, and Kadhal vaanoli… is a song from album, I badly miss and keep searching for long. Angadi Theru, has something touching along the end, but a nice ending at busy street.